Successfully Added Doppler Baby Heart Rate Monitor to your Shopping Cart. Simple Doppler baby heart rate monitor that helps you listen into the miracle of life. 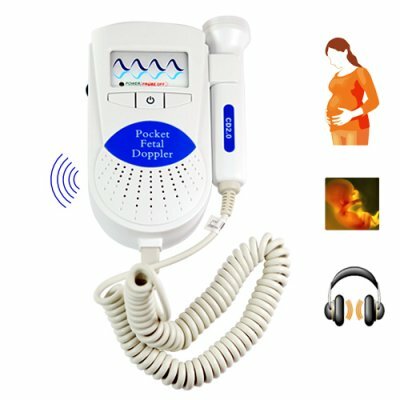 This simple to use Doppler let you listen to you baby's heart beat without the need of leaving your living room. Mothers can finally experience the joy of listening to their unborn baby's heart beat, with out having to get in the car and go on a stressful drive to the hospital. The built-in speaker along with the earphone input allows for optional listening of the baby's heart beat. With the loud onboard speaker, you can share your joy with family and friends. And if you are a computer savvy individual, then you can also use a 3.5mm jack cable to connect this baby heart rate monitor to your computer and record your baby's heart beat using the already provided sound recorder in the Windows operating system. This pocket sized portable heart rate monitor only requires 2 AA batteries to power-up and your good to go, allowing you to take your new Doppler heart rate monitor with you anywhere. The H23 is the simple version of our Doppler heart rate monitors. This model comes with a simple power ON/OFF button, earphone input and volume control. Straight from the box, insert two AA batteries and start listening to you baby's heart beat, and feel the joy that every mother does. The CVLT-H23 comes in a compact form factor designed to withstand repeated usage without wearing out or breaking. This extremely useful Doppler heart rate monitor is available in stock now for single and bulk purchases. Order yours today, and experience the divine pleasure of listing to your baby's heart beat right in your home. You can use sound recorder in the Windows OS to record your baby's heart beat. Click start, select programs, go to accessory, then select entertainment, and you will see the Sound Recorder application. What is the difference between the Doppler heart rate monitor model number H23 and model number H22? The baby heart monitor model number H22 comes with a heart BPM reader and an LCD display screen. The H23 baby heart rate monitor only allows you to listen to the heart beat, and does not support hear beat per minute reading function. Can this Doppler heart rate monitor be used on a any heart? No, but is works just fine with Vaseline or any type of gel body wash.